The DA62 MPP is a new special mission aircraft from Diamond Aircraft Industries. The DA62 MPP can fly at a maximum speed of 352km/h. The cockpit of DA62 MPP is equipped with Garmin G1000 NXi avionics suite. 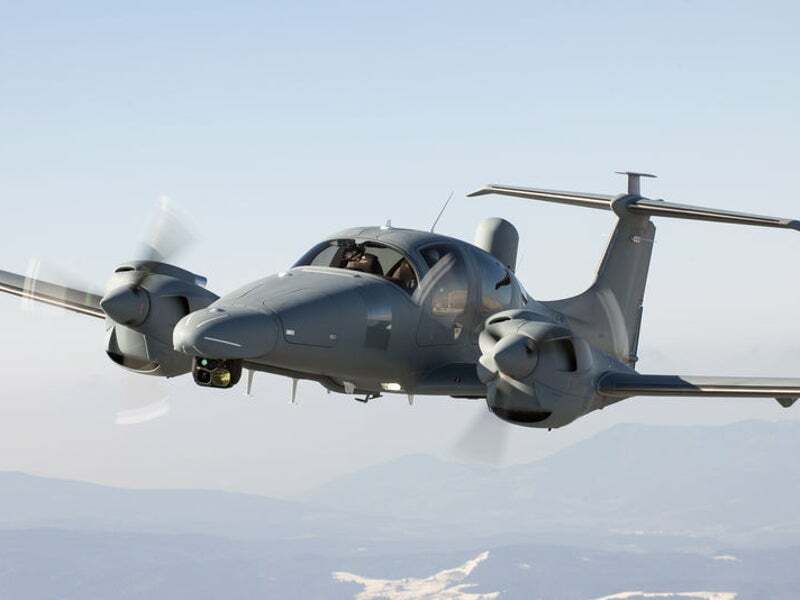 The DA62 MPP (multipurpose platform) is a new special mission aircraft developed by Diamond Aircraft Industries. Based on the DA62 twin-engine light aircraft, the DA62 MPP was unveiled at the 2017 Paris Air Show. The aircraft is an ideal platform for law enforcement, search-and-rescue (SAR), land and coastal surveillance, disaster management, infrastructure and environmental monitoring missions. The fixed-wing aircraft features a sleek all-carbon composite airframe with advanced aerodynamics. The fuselage is of monocoque construction with corrosion-resistant subsystems. The structure integrates new-generation passive safety technology to deliver high-performance and superior crew protection. The ergonomically optimised cabin provides enough space to accommodate up to two pilots and two operators. The occupants can enter and exit the aircraft through two forward gull-wing doors. The fuselage also offers ample storage volume for mission equipment and systems. The DA62 MPP has a length of 9.19m, height of 2.82m and a wingspan of 14.55m. It has an empty weight of 1,590kg and maximum take-off weight (MTOW) of 2,300kg. The aircraft can carry a maximum payload of 710kg. The cockpit of DA62 MPP integrates a state-of-the-art Garmin G1000 NXi avionics suite and fully integrated GFC700 three-axis automatic flight control system with flight director and yaw damper. The Garmin G1000 integrated flight deck is equipped with high-resolution primary and multifunction displays, GMC/GCU remote controllers, an air data computer, an air data and attitude heading reference system (ADAHRS), a magnetometer and a transponder. The avionics suite also integrates the SurfaceWatch runway identification and alerting technology, as well as an automatic dependent surveillance-broadcast (ADS-B) for traffic and subscription-free weather data. The nose section of the aircraft houses electro-optical (EO)/infrared (IR) turrets with a maximum weight of up to 100kg. The under-fuselage can support the carriage of payloads of up to 50kg for maritime or land radar applications. The aircraft also integrates a newly designed satellite communication (SATCOM) pod carrying L, Ku and Ka-band antennae. The aircraft is also equipped with an operator station with consoles for one or two operators to control and monitor the sensors on-board. The DA62MPP is also offered with special mission turnkey solutions. The turnkey solutions include a fixed-wing remote sensing platform, airborne sensors, data-links, and land-based stations. The operators are also provided with global support, spares, tooling, transport and associated pilot, and operator and maintenance training. The DA62 MPP is powered by two Austro Engine AE330 turbo-charged common-rail injected 2.0l jet fuel engines equipped with the single lever electronic engine control unit (EECU). Each engine is coupled to a MTV-6-R-C-F/CF 194-80 three-bladed constant speed propeller. The engines are compatible with Jet A-1, Jet A, TS-1, RT, No. 3 jet fuel and JP-8 fuels. The aircraft burns 28l/h, while utilising 35% of power at loiter speed. The aircraft can carry a maximum fuel load of 326l. Its main tank has the capacity to hold 189l, while the auxiliary tank can carry 137l of fuel. The exhaust system on top of the power-plant blends fresh air with engine exhaust and uses the cowling as a shield to supress the noise and IR signatures. The aircraft has a minimum operational speed of 140km/h and can fly at a maximum speed of 352km/h. The maximum airborne endurance of the aircraft is 11.7 hours. The DA62 MPP can attain a maximum range of 1,356km at 50% power at 14,000ft. The take-off distance required for the aircraft is 883m, while ground roll/landing distance needed for the landing operation is 441m/779m. The aircraft can reach a maximum altitude of 6,096m. It delivers superior performance than larger and expensive conventional turboprop aircraft.